Here we are at the end of another year. Out on the world's stage, it's been an eventful twelve months consisting of not one royal wedding but two! We saw Donald Trump and Kim Jong Un hang out at a hotel in Singapore. In England, we rejoiced at coming fourth in the World Cup (this is good!) during one on of the hottest summers on records. And there's the matter of Brexit which rumbles down its rocky road to a conclusion we do not know. So what about back at M&M Towers? 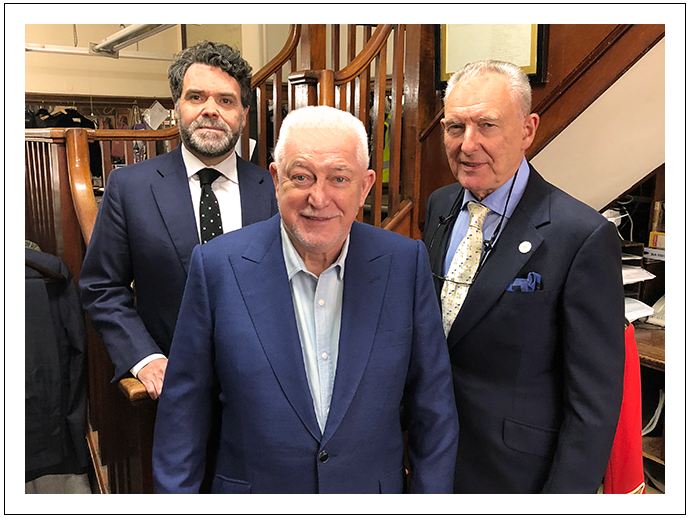 It's been an active year as any for bespoke tailors Brian Lewis, Paul Munday and Steve Phythian. Sadly, we did lose our alteration tailor, Norris, who passed in June of this year. He was a fixture downstairs with the other tailors. His presence and skill are missed. In January, most heads were kept down in that post Christmas gloom which descends as one reflects in shame on the calorie and alcohol intake over the holiday period. We did manage to pull ourselves together to provide some guidance on how to button two and three button jackets. Weathermen, please take note! Paul made his first Overseas trip of the year flying out on the first of many flights to Paris. As proud Royal Warrant Holders to the Queen, we were thrilled to hear the announcement from Kensington Palace that Prince Harry and Megan Markle were tying a Royal Knot in May. This clashed somewhat with Prince William's commitment as president of the Football Association. The FA Cup Final was on the same day, which he usually attends and presents the trophy. However, with his brother asking him to be best man, the Duke of Cambridge was understandably relieved if his duties to football that day. March was a busy month at M&M Towers. We officially launched our Made-to-Measure range of garments and opened our online shop selling braces and ties. To illustrate the differences between this and our bespoke service we published a guide on their differences here. Over in New York City, the Fashion Institute of Technology (FIT) got in touch with us to confirm whether an overcoat, once owned by HRH Prince of Wales was made by ourselves in 1900. It was so we were happy to have one of our coat's on display in their Pockets to Purses: Fashion + Function exhibition. It prompted Marketing to write a piece on this called Pockets, Princes & NYC's Fashion Institute of Technology (FIT). Fortuitously, director Paul Munday was flying out to NYC to see our customers so was able to visit the exhibition to see our past work. 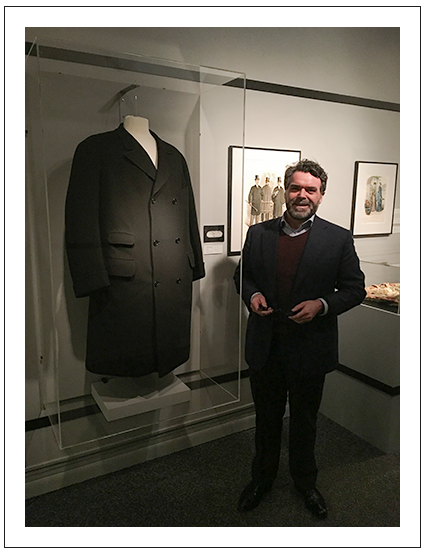 He was met by members of the FIT team and taken on a tour of the exhibition and got to see the coat. In April the Duke and Duchess of Cambridge (Kate & Wills) introduced another Royal to the Royal Family with the arrival of Prince Louis on 23rd April. 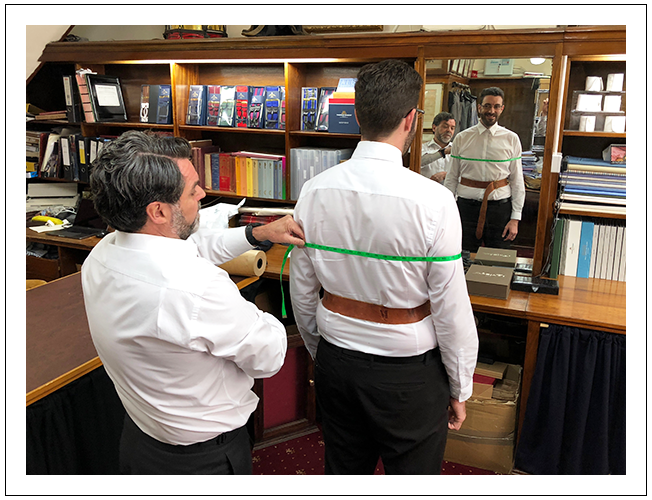 In the same month, we continued celebrating the launch of our Made-to-Measure range by publishing our History of the Suit Parts I and II. In the first instalment, we discovered the importance a few people had on the development of the suit we know today. There is Charles II who in 1666 set the sartorial standard by decreeing English court men should wear a long coat, a petticoat (a waistcoat), a cravat (a precursor to the necktie) and breeches. The other notable individual was original dandy Beau Brummell (1778-1840) who famously rejected frills, frocks and powdered wigs in favour of a simple jacket and long tight trousers. By doing so, he introduced the idea of a more uncomplicated men’s suit to the world. Up until the 19th Century, the suits progression was dictated mainly by dignitaries. However, in the 20th Century, we saw in the second instalment how changes were made by the working classes, particularly by the Teddy Boy and Mod subcultures. 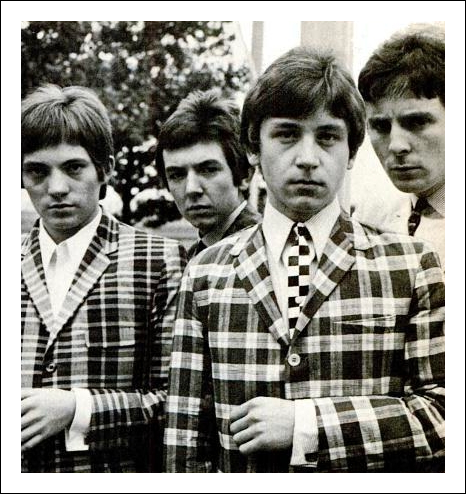 On Savile Row, two notable figures Tommy Nutter and Paul Munday’s old boss Edward Sexton modernised bespoke tailoring by attracting a Rolling Stone or two and Elton John. Violinist Charlie Siem is a valued customer of ours. It was in April he shared an image of himself online with his mother. 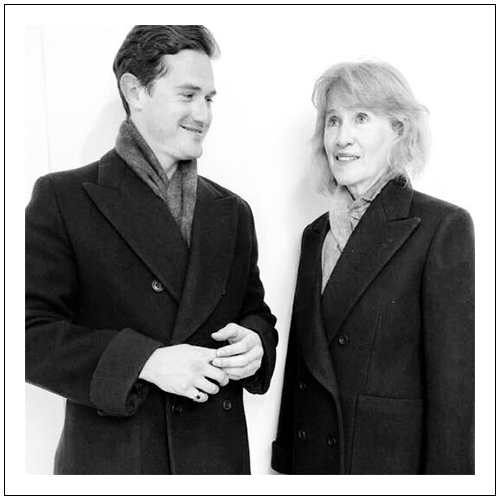 So pleased he was with his M&M overcoat, he had one made for Mrs Siem too which is shown here. In May, you may have noticed a certain couple getting married over in Windsor. It was, of course, Prince Harry and Megan Markle and it proved to be a magical day indeed. We are, as we have already mentioned proud Royal Warrant Holders to the Queen. In fact, it is specifically to her Military Knights and the provision of their uniforms, which HRH pays for herself. The Military Knights are retired military officers who live in the grounds of Windsor Castle. One of their jobs is to provide support for services at St George’s Chapel, which is where the wedding took place. We wrote about the Military Knights in our Military Q&A here, published in August. At the time, we inquired into how Brian Lewis, Malcolm Plews and Paul Munday would spend the day with the results found here in The Royal Wedding Q&A. 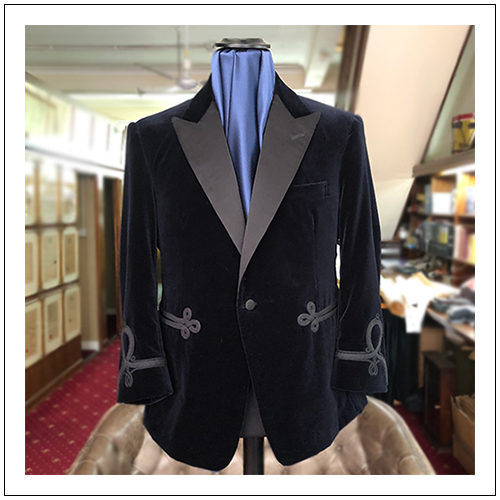 In the same month, Brian completed work on a velvet smoking jacket inspired by Churchill’s time in the 4th Hussars. Brian borrowed elements from Churchill's mess kit, most notably the embroidery, to decorate the sleeves and pocket openings. It is a beautiful garment and an interesting take, thanks to Brian, on what can be done with a smoking jacket. Staying with Brian, May was the month he welcomed Alastair Bruce and James Longman US broadcasting company ABC. 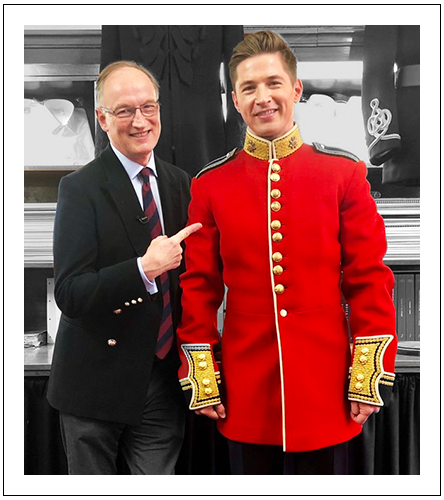 In researching for a programme Alastair spoke to Brian about military uniforms and tunics. This seemed appropriate, given it was Brian Lewis who made Alastair’s uniform back in 1980. James models, and very much looks the part, in one of the M&M uniforms on display in the showroom. Meanwhile, over on the Meyer & Mortimer Twitter account, a Tweet highlighting the style choices available (seen below) on our Made-to-Measure trousers became our most popular post ever. Which we hope said: Thank you for your Likes and Retweets. If May wasn’t busy enough we also the subject of a blog for an online publication called The House of Bourbon who interviewed director, Paul Munday. The House of Bourbon is determined to educate the good people of Yorkshire (where they are based), and beyond, in everything to do with menswear, style and sophistication. 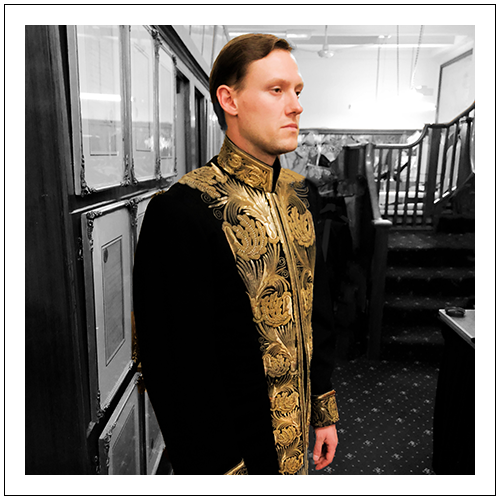 In June, Brian Lewis completed work on a most mysterious & beautiful ceremonial coat was brought to us back in December 2017 to be repaired. If we're honest, we didn’t know much about its origins other than it hails from the Middle East and is about 175 years old. It took six months to complete, and we tracked its progress and brought in Steve to model. It was another opportunity to work on his Blue Steel gaze. Also in June, we received a visit from Darrell Smith who owns a carpet and flooring company, Archway Carpets, in the lovely town of Woodbridge in Suffolk. Yes, Darrell was coming for a fitting for a jacket but the cloth he chose for it was going to be a little weightier than your average 16oz. Suffice to say, the results should be fascinating indeed. Watch this space. As the summer was hotting up and we were all dizzy with extended periods of sun and uncanceled barbecues the World Cup, ahem, kicked off in Russia. With the majority of the bespoke team being of English descent, there was the usual bi-annual (with the Euros two years later) cognitive process of lowering one’s expectations. We can assure our US readers, we are not falling foul of any English clichés here. Over the last few decades, our performance on soccer’s world stage can only be adequately described as sh*t.
The fact that manager Gareth Southgate, as a player had been stained with failure missing a crucial penalty in Euro 96, and was now putting out a young team who wouldn’t look out of place delivering your morning paper. This didn’t fill us with any confidence. Needless to say, despite our wildly incorrect predictions, sadly documented here in two videos, we were proved wrong. Gareth & Co took us on the ride of our lives where for a short time we thought ‘we could do this you know’. We were knocked out however in the semis by Croatia, but it didn’t matter, our low expectations were shattered, and belief and pride returned for our young lions. Part II Now Published Here!